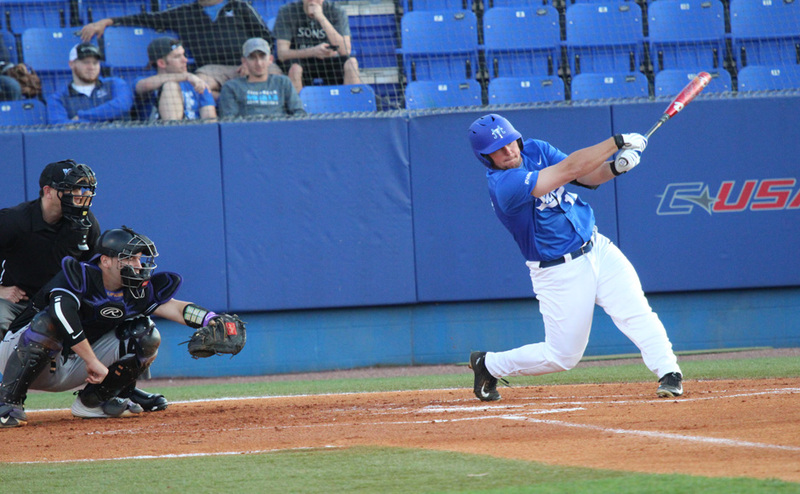 Middle Tennessee's Blue Raiders fail to find answers in their 8-1 loss to Libscomb on Wednesday March 24, 2015. 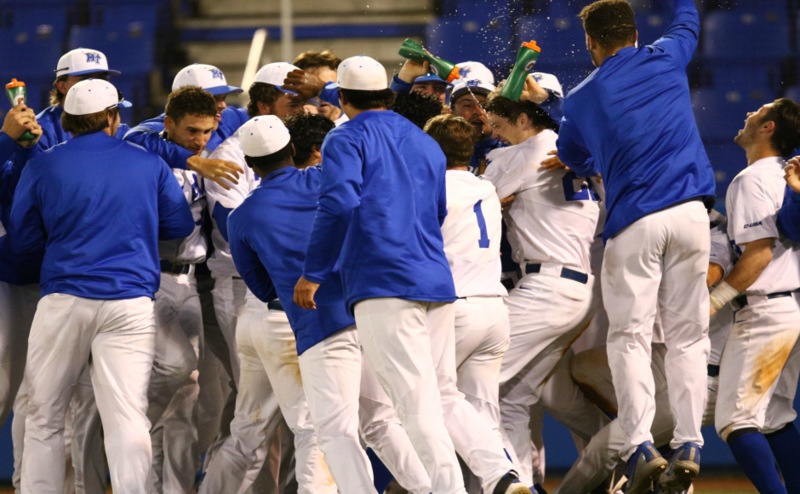 MURFREESBORO – Middle Tennessee completed the sweep of Old Dominion in dramatic fashion Sunday. With the score tied 4-4 in the bottom of the ninth, a wild pitch allowed Jared Allen to race home to secure the game-winning run. After controlling the game, with a solid outing from starter Garret Ring, the Blue Raiders (16-10, 8-1 C-USA) saw their lead diminish when ODU slugger Nick Walker belted a two-run homer in the top of the ninth with MTSU just two outs away from victory. Down by a run, MTSU’s bats came to life, with Dustin Delgado leading off with a double. Speedster Ronnie Jebavy was able to get on base due to a walk. He then stole his league-leading 14th base of the season to get into scoring position, setting up Michael Adkins to tie the game up with an RBI double. Two batters later, Allen made the gutsy move to go for the win when an errant pitch caused ODU’s catcher, Mike Perez, to get out of position just long enough for Allen to slide head-first across home plate, giving MTSU the 5-4 win. The victory keeps MTSU in first place of the C-USA standings. The Blue Raiders are now 5-1 in one-run games this season. The trio of Jebavy, Delgado and Allen have come up big all season for the Blue Raiders, and they continued that trend today. Delgado (2-for-5) and Jebavy (2-for-4) led the team in hits. Allen knocked out his sixth home run of the year, a solo blast in the seventh, to go along with his ninth-inning heroics. Ring was dominant on the mound, striking out a career-high six hitters in five innings of work before being pulled for Sam Alton. Ring ended up with a no-decision. Alton pitched one inning of relief, allowing two hits in his brief appearance. Nathan Foriest came in to relieve Alton to begin the seventh. Foriest pitched 2.2 innings, surrendering two runs on four hits in his time on the mound. Kooper Kessler (2-0) recorded the victory for MTSU. He came in with a runner at second. Kessler allowed a hit to the only batter he faced, but Allen nailed ODU’s Chris Livens at home, preventing him from scoring. Thomas Busbice (3-1) was saddled with the loss for ODU (13-11, 3-6 C-USA) Sunday. He threw four innings of three-hit, three-run baseball. Busbice walked three and struck out five. His lone wild pitch in the bottom of the ninth was the difference in the game. The game was evenly played on both sides, with both teams recording an error. ODU did outhit MTSU, 11-9. 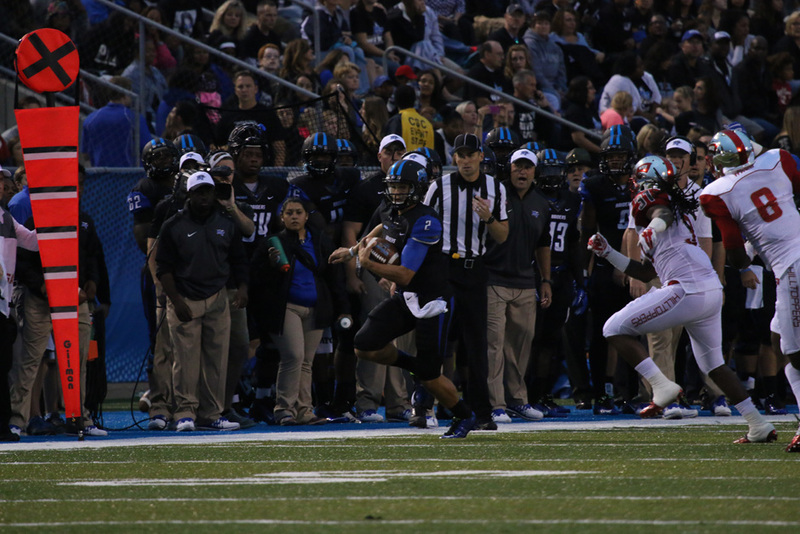 The Blue Raiders will step out of C-USA play for their next game. They will host Austin Peay Tuesday, the last game of their season-long six-game homestand. First pitch is slated for 6 p.m. CST. It will be the last game before MTSU heads to Houston to face No. 14 Rice. Rice is currently second in the C-USA standings, right behind MTSU.